The city of Lorain has scored $4 million to create a facility that will reuse sediment scooped out of the Black River. State Sen. Gayle Manning, R-North Ridgeville, on Dec. 4 announced Ohio State Controlling Board approval of $9.9 million in capital funds for the Toledo-Lucas County Port Authority. 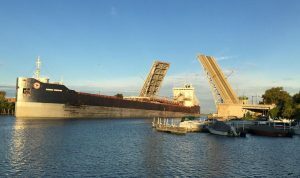 The money will be used for three dredge material reuse projects, including in Lorain. The city will use $4 million for planning, design, permitting and construction of a new Black River Dredge Reuse Facility that will be located on a 30-acre site within a larger reclamation facility owned by the city. The projects were made possible by the Healthy Lake Erie Initiative in legislation known as Senate Bill 299. The money was designated with the goal of reducing open lake dumping of dredged materials by 2020. 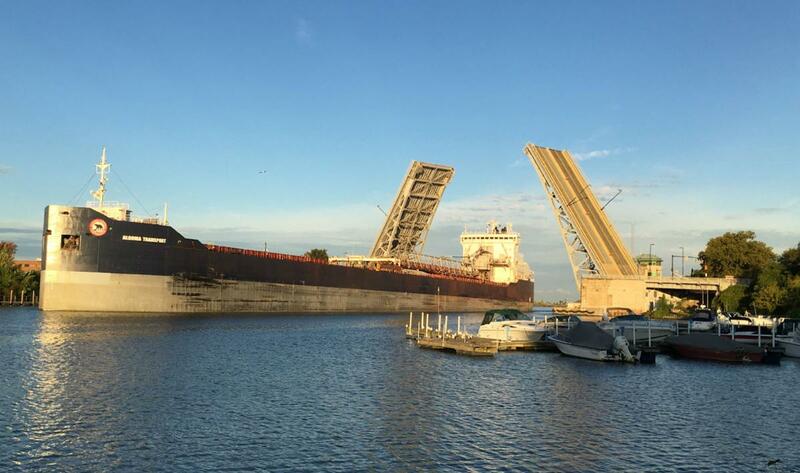 The material is sediment and sand that is dredged from the bottom of the Black River to maintain the required depth for freighters to enter and leave the Port of Lorain. Riding the wave of redevelopment along Broadway, Shawn Grieves and Tim Scholl are looking to bring a restaurant and retail store downtown. The pair bought the building at 422 Broadway and plan to transform what used to be clothing and jewelry stores into Union Town Provisions. It will offer a casual but “delicious” dining experience, offering house-made cheese, charcuterie, sandwiches, pizza, baked goods, wine and preserves. October 24, 2018 – Key stakeholders in the Lorain community joined at the Charleston Coffee House for a special event designed to work toward a strategic plan to reinvigorate the downtown and waterfront of Lorain. Among those to present downtown initiatives were representatives from the Lorain County Port Authority,USEPA Region 5, and the City of Lorain, as well as members of the Lorain Historical Society, Lorain Public Health, the Lorain Metropolitan Housing Authority, and the Rotary Club of Lorain. The four focus areas of the workshop were: improving broadband downtown, public/private partnerships, sustainable redevelopment, and investment. Following the community brief on ongoing projects, Vita Nuova members guided workshop attendees through the PREPARED workshop process and led community exercises and discussions on goal development, opportunities and obstacles action item prioritization, and development of a strategic action item list. The workshop closed with a presentation on the findings from the Area-Wide Planning Project and a dinner for the community members in attendance at the event. A report will be generated and posted on this website and this group has committed to meet on a quarterly basis to help implement the steps agreed upon in the workshop. The workshop was sponsored by the Lorain County Port Authority funded by USEPA’s Land Revitalization Program. Lorain County in partnership with the cities of Oberlin and Sheffield Lake applied for and received $1,150,000 in Community Housing Impact and Preservation (CHIP) Program. As partners each community has funds set aside to address home repair and rehabilitation of privately owned – owner occupied housing. Applications for assistance are being released on October 1 and may be turned in starting on October 2nd through November 28th. To be eligible for the assistance the housing unit must be occupied by the owner as their primary residence. Household income must be at 80% or less of Area Median Income which is adjusted for the number of persons living in the house. The home needs to be located in a township, village, or the cities of Amherst, Avon, Avon Lake, Oberlin or Sheffield Lake. Applications need to be turned into Lorain County Community Development Department at 226 Middle Avenue, 5th Floor, Elyria OH 44035. The Home Repair Program is typically a one item project such as a roof repair, a furnace, a hot water tank or other code related item. The Private Owner Rehabilitation is a more intensive program that addresses all code related items within the home and will address multiple repairs. While the programs are designed to be grants, liens will be placed on the home that will be forgiven over a period of time. There is no out of pocket costs to the home owner if they meet the terms of the program. For more information please call (440) 328-2322 and ask for Linda Blanchette or Drake Hopewell. In a boon for Lorain downtown redevelopmnet, the Lorain City Council has approved the financial incentive package for the Ariel on Broadway LLC, the Cleveland Development firm that is planning to create a 55-unit hotel and gathering space in the Broadway Building. The project, which will cost around $8 million, will receive two kinds of financial assistance from new city legislation. Firstly, the city will forgive 100% of the property taxes for improvements to the building for the next 12 years. Secondly, the council voted to create a Tax Increment Financing District (TIF) for the hotel which will forgive property taxes for improvements to the building for 30 years. Both measures were passed unanimously by the council. 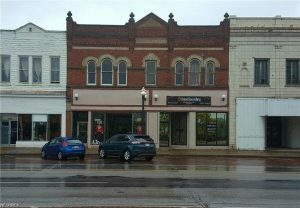 The project will bring new life to the historic Broadway Building and will aid in the revitalization of Lorain’s downtown area. Read more about the recently approved financial incentives in the Morning Journal article here. 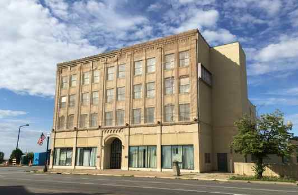 In a separate article, Port Authority Executive Director, Tom Brown, says that projects like the Broadway Building can be part of a series of smaller successes that will lead to the overall revitalization of Lorain. Read more on Tom Brown’s comments on downtown revitalization, and on the Port Authority’s role in that revitalization, here. Join us for an Information Session on the ongoing Expression of Interest in Lorain County. 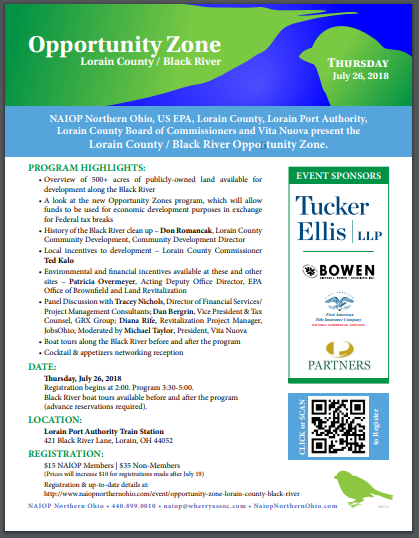 What: a chance to hear from Lorain City and County officials and participate in land or water tours of the exciting opportunities Lorain has to offer. The Lorain Harbor Area-Wide Planning Project Area consists of five publicly-owned properties, totaling 534 acres, located along the Black River and within close proximity to Lake Erie. These five sites are important to the revitalization of Lorain’s historic urban waterfront. The project area has the potential to transform into a mixed-use and sustainable community, featuring nature trails that connect the public to Lake Erie. In addition, all the sites are adjacent to the downtown area and have water access. For more information, please explore our website www.LorainHarborAWP.com and check out our fact sheets. If you are interested in participating in this EOI process, please contact Tiffany McClelland at the City of Lorain Port Authority, tmcclelland@lorainportauthority.com, (440)204-1194 or Will Warren, Project Manager, Vita Nuova LLC, warren@vitanuova.net, (888) 508-6710. 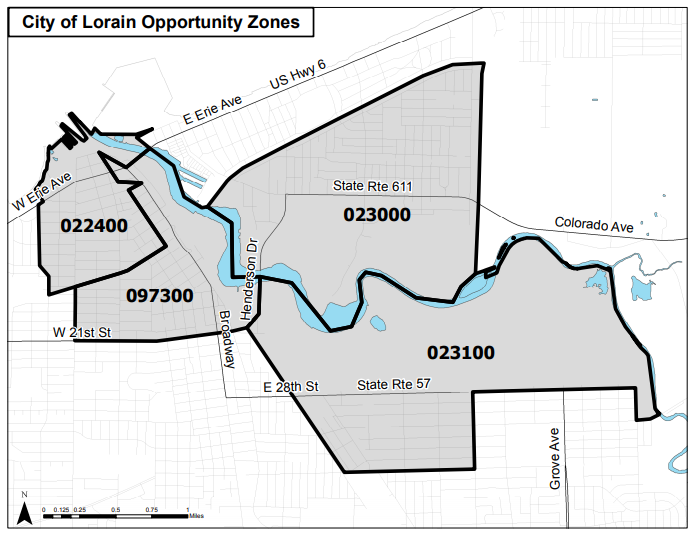 On March 21st the Lorain County Board of Commissioners learned that the State has nominated 5 tracts within Lorain County to be Opportunity Zones as part of the Investment in Opportunity Act. The nomination of 5 tracts, 4 in Lorain and 1 in Elyria, is notable as it is more than double the number of tracts that were nominated within other counties similarly situated within the region. The Investment in Opportunity Act was signed into law in December 2017 as part of the Tax Cut and Jobs Act. The law seeks to bolster economically depressed areas across the U.S. by offering deferred taxes and significant tax breaks to those parties willing to sustain investment in low-income areas. Incentives for a broad array of investors in designated “Opportunity Zones” will deploy capital in vulnerable and underserved areas at a low risk to investors. Opportunity Zones will act as a compliment to the New Market Tax Credit Program to help underserved communities promote community development projects. Investors may temporarily defer the recognition of capital gains that are invested in the Opportunity Zones. A new class of private investment vehicles called “Opportunity Funds”, which are investment vehicles organized as corporations or partnerships that hold at least 90% of their assets in opportunity zone assets, have been created. Investments in Opportunity Zones or Opportunity Funds that are held for at least five years are eligible for capital gains tax reductions, and investments held for at least 10 years are eligible for capital gains exemptions. As the incentives are linked to the duration of the investor’s commitment to the Opportunity Zone rather than an upfront subsidy, the program provides an incentive for investors to re-invest their capital gains in Opportunity Funds to provide patient capital for low-income communities. Team NEO, the Fund, Lorain City Port Authority and City of Lorain worked together on the request for nominations, which made the Lorain requests attractive to the State which put a priority on tracts that had regional support. “Working with local and regional partners allowed us to pull together a strong list of tracts that were nominated. Now we will be working to see these zones put to work and attract needed investment in our communities through the actions of the County and its partners in the Port, Land Bank and the cities of Lorain and Elyria.” said Commissioner Kalo. Each of the nominated tracts in the City of Lorain were located within a planning area designated by the County and funded by the USEPA. This planning effort will result in 6 strategic developable land areas being brought to market. The designation of these as Opportunity Zones should enhance the level and speed of development. For additional information please call 440-328-2322 and ask for Don Romancak.